When it comes to a fast-paced work environment, the easier it is for your employees to get on and off the clock, the better. Too often, valuable time is wasted while employees wait in line to punch in and out of an outdated time clock system. That’s why we created our employee time clock software to make the process of clocking in and out faster than ever. With the Orbital Shift Clock Station, clocking in and out of a shift is as quick and easy as unlocking a phone screen. Managers can simply select a designated device, like a tablet or laptop, load the pre-created device station URL and start reaping the benefits of a more engaged and streamlined workforce. 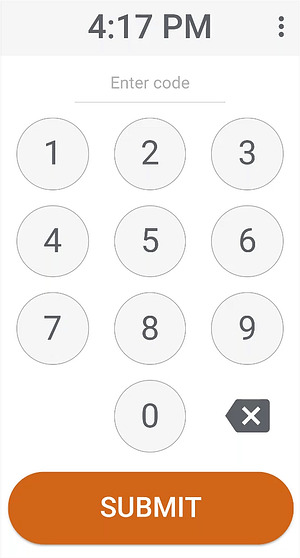 Once activated, employees can start and end their shifts by entering their unique, numeric punch code into the designated device. As soon as the punch code is entered, the Clock Station will show the employee's shift information. Then the system will automatically log out and return to the blank station screen for the next user. You can set up your own employee clock devices in the Time Clock section under Location Settings. Simply check the box next to ‘Enable Clock Station,’ and your soon your employees will be clocking in and out in seconds. Assigning employee station codes can also be done in seconds under the Employee Info section. For optimal time and attendance tracking, pair your clock device with restricted clock-in access to a specific device or IP address. This ensures employees will only be able to start and end their shifts from the designated employee Clock Station, while the ability to clock in and out from phones or other devices will be disabled. This will also help managers rest easy knowing employees are always on location when starting and ending their shifts. Restricting the clock location is as easy as checking a box in the Time Clock section of the Location Settings. Setting up a specific device to use for your employee Clock Station is as easy as entering a device in the Clock Locations tab under Location Settings. Once enabled, employees will be able to punch their code into the clock device quickly. As soon as an employee enters their code and clicks the orange ‘Clock’ button, their shift will have officially begun, and will be recorded in the employee time clock software for accurate time and attendance tracking - every time.